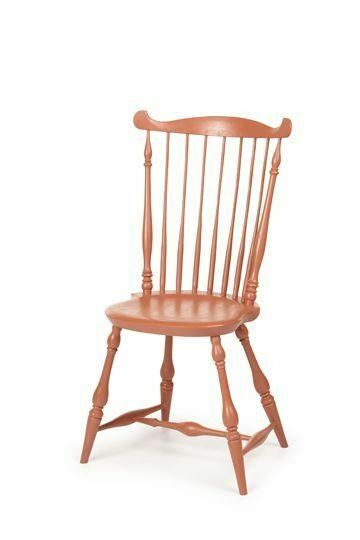 My hand-made Windsor Chairs have been featured in Early American Life's Directory of Traditional American Crafts since 2010 and are available in a range of traditional designs. The Fan-back side chair (shown here) features uncarved turned up ears that rise higher than the center of the crest rail, and a modifed shield seat. Each of our chair begins with locally grown green lumber. Every seat is hand-carved from Eastern White Pine. We do all of our turnings by hand on a lathe, out of maple or black birch. Every spindle is rived (split) from the log and shaved on a shave horse to ensure the grain is left unbroken from end to end. This traditional process is repeated on the chair's back before steaming and bending. The legs are set using a traditional tapered lock joint which increases the chair's stability. Finally everything is wedged, hand sanded and finished with your choice of colored lacquer or milk paint (shown here in traditional salmon milk paint with an oil finish). Every piece is custom made to order allowing us to tailor each commission to your specific needs (variety of wood and sizing). Each piece is custom made-to-order, please allow 6-8 weeks. The price is for local pick up only. I can help you arrange shipping. I offer standard crating and white glove delivery (pricing will vary).